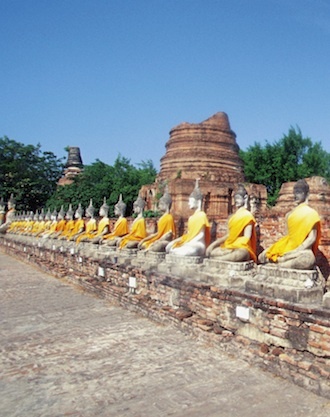 Buddhism in Thailand is strongly influenced by traditional beliefs regarding ancestral and natural spirits, which have been incorporated into Buddhist cosmology. Most Thai people own spirit houses, miniature wooden houses in which they believe household spirits live. They present offerings of food and drink to these spirits to keep them happy. If these spirits aren't happy, it is believed that they will inhabit the larger household of the Thai, and cause chaos. These spirit houses can be found in public places and in the streets of Thailand, where the public make offerings. 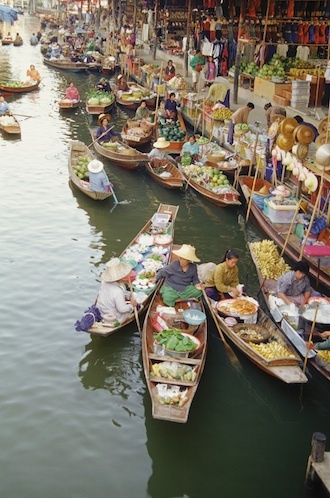 The culture of Thailand incorporates cultural beliefs and characteristics indigenous to the area known as modern day Thailand coupled with much influence from ancient India, China, Cambodia, along with the neighbouring pre-historic cultures of Southeast Asia. It is influenced primarily by Animism, Hinduism, Buddhism, as well as by later migrations from China, and southern India. Traditional Thai art is primarily composed of Buddhist art. Traditional Thai sculpture almost exclusively depicts images of the Buddha. Traditional Thai paintings usually consist of book illustrations, and painted ornamentation of buildings such as palaces and temples. Thai visual art was traditionally primarily Buddhist. Thai Buddha images from different periods have a number of distinctive styles. Thai temple art and architecture evolved from a number of sources, one of them being Khmer architecture. Contemporary Thai art often combines traditional Thai elements with modern techniques. Literature in Thailand is heavily influenced by Indian Hindu culture. The most notable works of Thai literature are a version of the Ramayana, a Hindu religious epic, called the Ramakien, written in part by Kings Rama I and Rama II, and the poetry of Sunthorn Phu. There is no tradition of spoken drama in Thailand, the role instead being filled by Thai dance. This is divided into three categories- khon, lakhon and likay- khon being the most elaborate and likay the most popular. Nang drama, a form of shadow play, is found in the south. 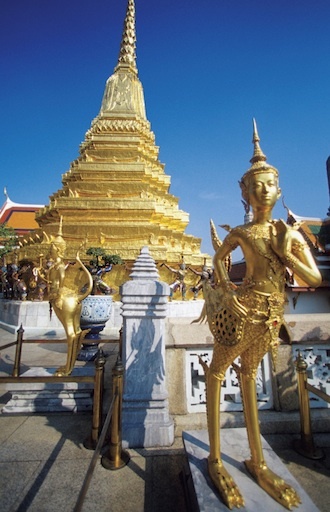 From - Wikipedia, Culture of Thailand, Online 26 May 2011.